Two years ago, we visited the Palm Springs Art Museum, and on a return trip just last week, we stopped in at the Palm Desert museum location. 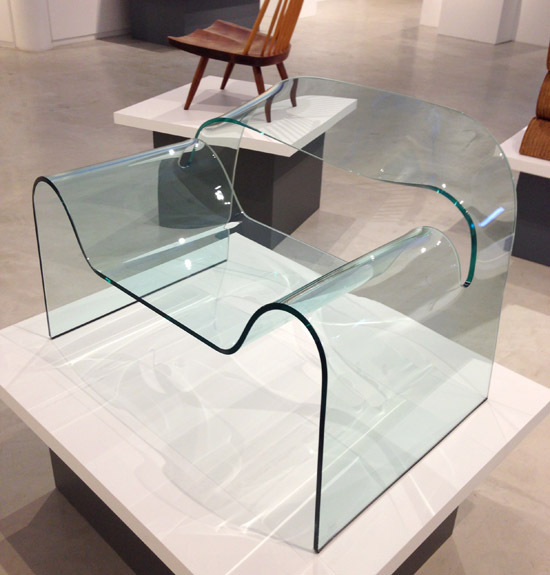 The current exhibit is titled Recline/Design: Art and Aesthetics of Repose. 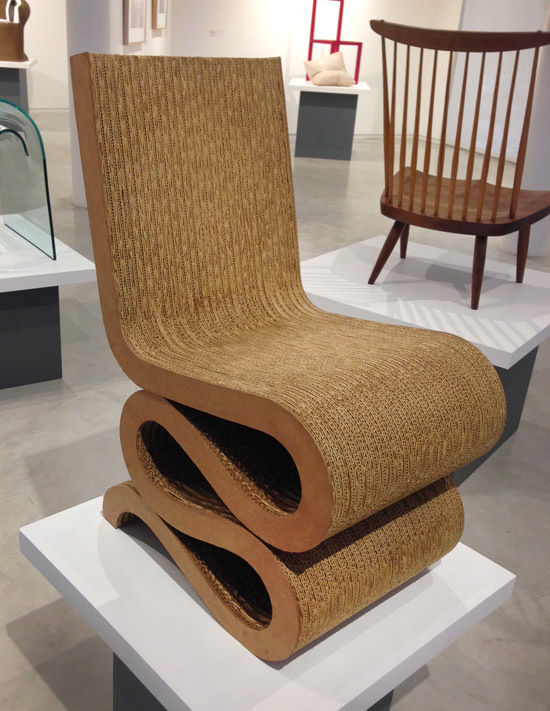 I was delighted to see this chair by Frank Gehry. I first read about his foray into cardboard furniture when I read Frank Gehyr: Buildings and Projects back in about 1991. Gehry wrote: My intention was to design the ultimate inexpensive furniture, something that could be sold cheaply and that would be acceptable to a mass market–It was market-tested–and lots of different kinds of people bought it. It reinforced all my feelings about trying to build cheaply in architecture. I knew somewhere there was a key to building inexpensive architecture; uncompromising forms that would be acceptable to the mass market. This chair was built in 1972. 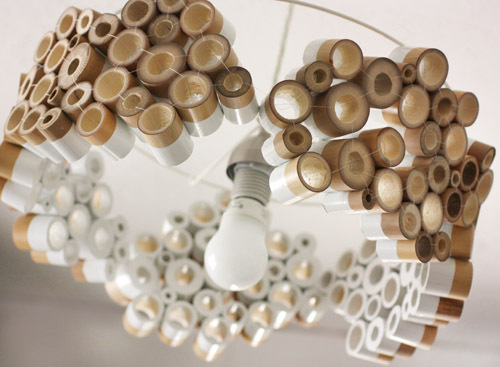 It’s made from 60 layers of corrugated cardboard with hidden screws and fiberboard edging. This glass chair, titled Ghost, was designed by Cini Boeri and Tomu Katayanagi and manufactured by Fiam Italia in 1987. It’s made from a single piece of one-half inch thick glass. 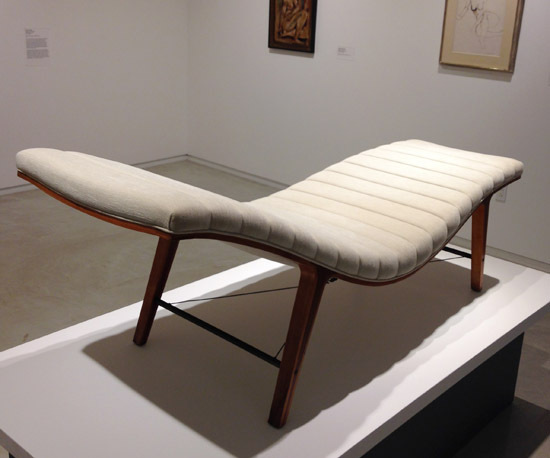 This Listen to Me Chaise was designed by Edward Wormley in the late 1940s. It’s made from bent, laminated birch and cherry wood with metal and upholstery. 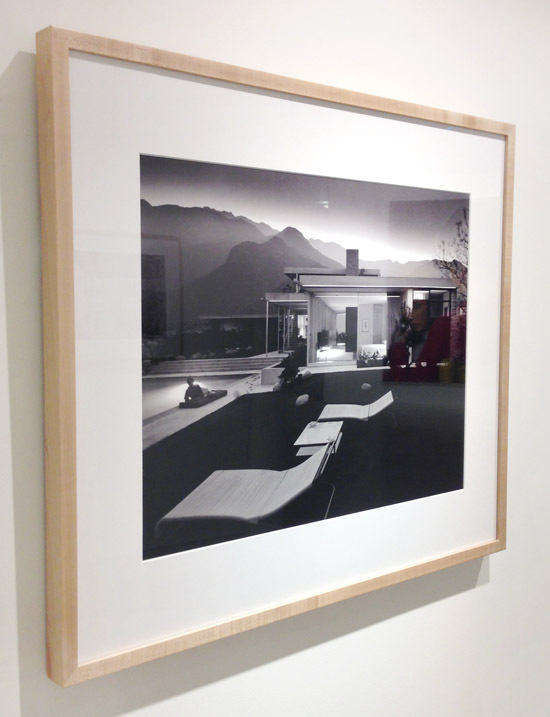 As part of the permanent collection, there were two Julius Shulman photos both of homes in Palm Springs. This photo was taken c. 1938, and the digital print was made in 2008. 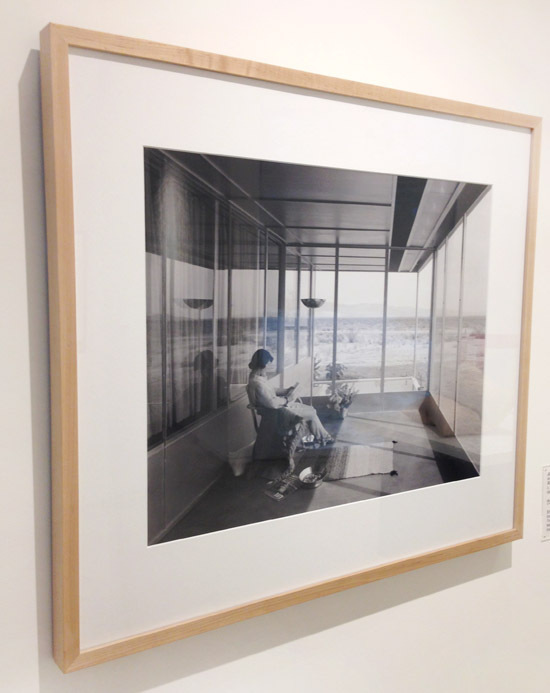 It’s from the Grace Lewis Miller House by Richard Neutra. 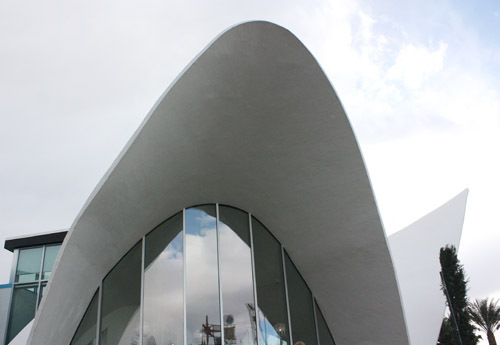 This was Shulman’s first professional work in the Palm Springs area. I had the pleasure of viewing the Edgar J. Kaufmann House two years ago, and it’s shown here in an iconic photo by Shulman. 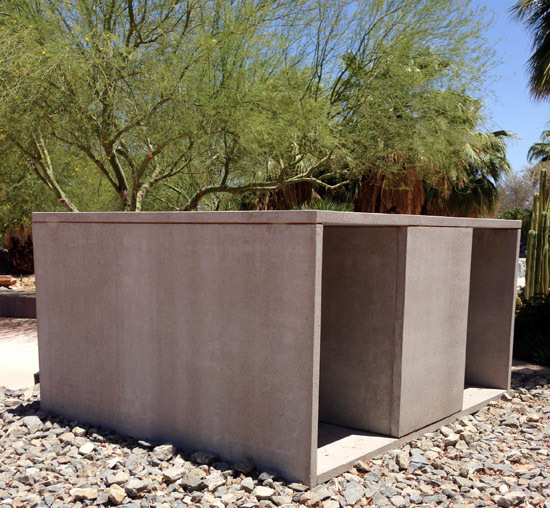 Outside, in the The Galen and the Faye Sarkowsky Sculpture Garden, there is an Untitled Donald Judd piece from 1988-1991. 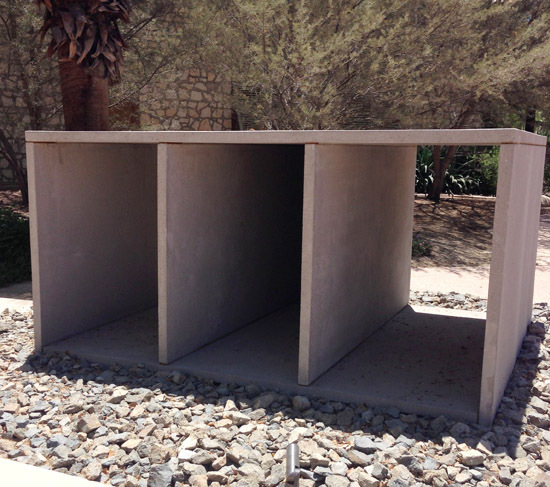 I became a fan of Donald Judd’s art as an architecture student but had only seen his work in books before seeing this. When we bought our house over thirteen years ago, we updated the floors in the kitchen and the bathroom and opened the wall between the kitchen and dining room to add a countertop with storage below. For all three of those projects, we used tile, and the leftover tile has been sitting in boxes for thirteen years. 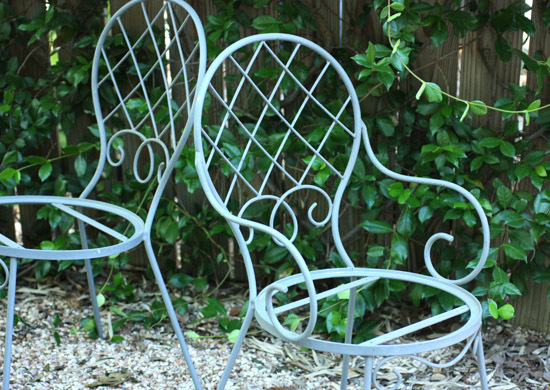 Also, we have a wrought-iron garden table and chairs that I have been meaning to address since we brought them home ages ago. The chairs came with simple rounds of plywood for seats that I always wanted to replace. 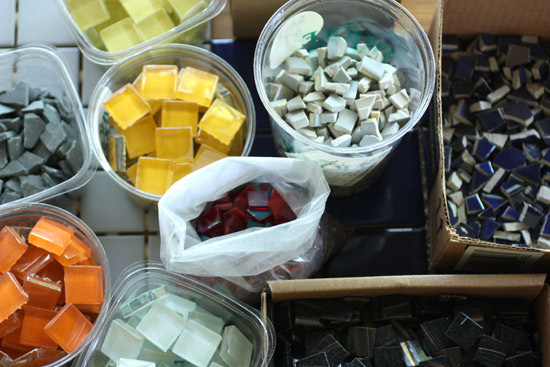 Recently, I was inspired to pull out all that leftover tile, bash it into tiny pieces and start imagining mosaic designs for the chair seats. I’ve also collected some other styles of tile to add additional colors to the designs. I have some experience in working with tile after doing our floors and working on the tile countertop, but I’ve also been reading about mosaics and techniques for creating them. I’m currently reading Mosaic Today by Elaine M. Goodwin which covers historical mosaic art as well as contemporary pieces in addition to offering step-by-step instructions for projects. It will be a slow process, but I’m looking forward to having some colorful, new, tiled chair seats around the garden table. 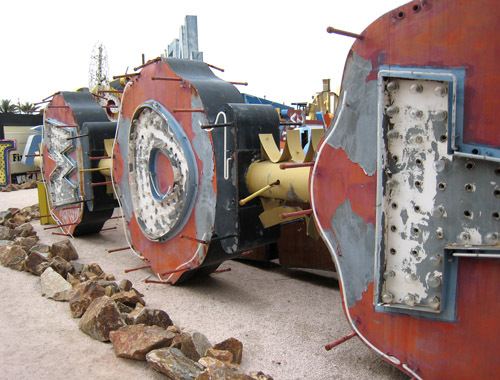 I’m not sure if The Neon Museum is the right name for this place. 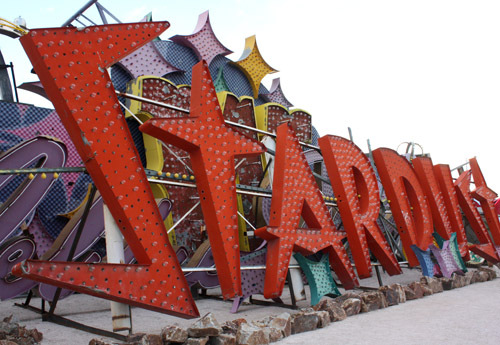 Maybe it should be The History of Las Vegas Through Illuminated Signs Museum, but that’s a little wordy. 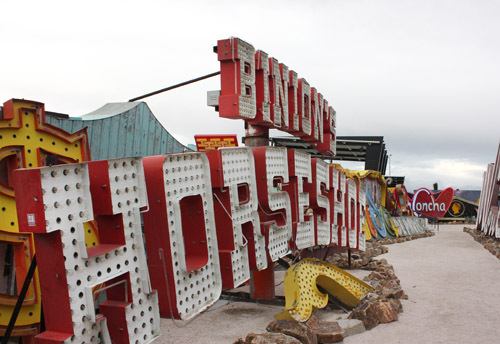 The property is home to a collection of more than 150 signs from hotels, casinos, restaurants, clubs, and other businesses. Some of the properties no longer exist and some just have new signs now. Visitors are given guided tours through the collection, and stories are shared about each property that has donated pieces. The signs, and parts and pieces of signs, are sitting on the ground in what’s called the boneyard. As you walk through the yard with the signs at eye level, you can see the detail of construction and the way the lights were arranged. There’s usually a mix of incandescent lighting and neon. A few of the signs have been restored to shine as brightly as ever. The office for the museum is made from the restored and relocated shell of La Concha Motel which was designed by architect Paul Williams. 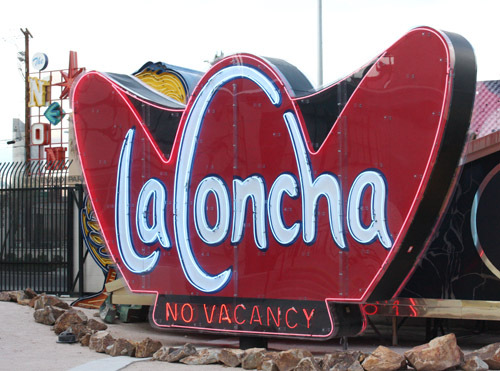 The sign from La Concha is one of the few restored and illuminated ones in the boneyard. 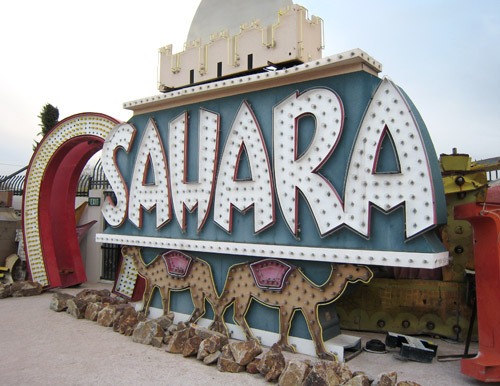 Some of the older signs were built with protruding metal rods which were standard pipe cut to the same length. Those rods were used by workers who climbed them when lights needed to be replaced. The tubes used for neon lights are powder coated on the inner surface in different colors to produce different hues of illumination. The yellow tubes on the Agave sign actually displayed a green light. 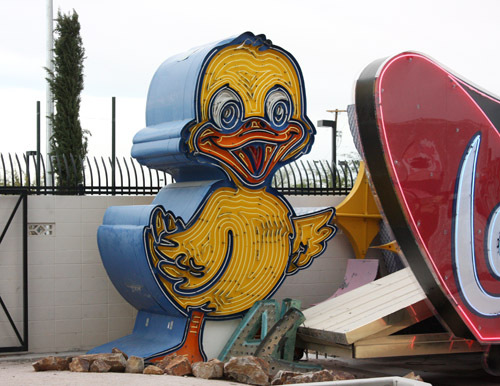 The neon duck, donated from a car wash, was one of the most complex neon designs. Metal edges were used around neon tubes that were intended to delineate lines. Other areas were not edged where the light from the neon was allowed to flood the shape. In addition to the details of the edging, this sign is also two-sided making it an expensive piece. 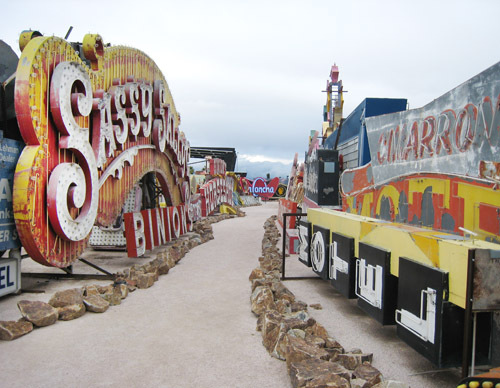 Just outside of The Neon Museum, Las Vegas Boulevard is part of the Scenic Byways project where more restored signs can be seen along the street. This is the only example of a scenic byway that’s not a piece of natural scenery. It was nice to take some time to wander through a bit of the past in a city that’s usually focused on the newest thing to be built. Although some architectural history courses were required in the degree program when I studied architecture, I spent a lot more time reading about contemporary architecture back then. When it came to anything from the past, my interest was primarily in the Modern movement. These days, I find it interesting to take a moment to learn something new and appreciate some styles of architecture that weren’t on my radar back in my college and graduate school days. I recently received a review copy of Great Houses of London which introduced me to the very best examples of grand, residential architecture within the city of London. Each example was originally built as a private home, but most have now become offices, embassies, hotels, or museums. However, they all retain key elements of their original grandeur. Some are stand-alone structures, but the vertical style of British terraced houses figures prominently. With those terraced houses, it’s interesting to note that while the exterior was typically simple and consistent with the entire, connected row of houses, the designs of the interiors were intricate, specific, and ornate. The photos throughout the book display the beautifully maintained highlights of each house. I imagined walking through these spaces and wondered what it must have been like to live there and regard them as “home.” The photo at the top of this post shows the entry staircase from Home House on Portman Square designed by Robert Adam in 1775. That staircase replaced a previous one designed by James Wyatt and with its balanced symmetry and skylit glass dome above became a pinnacle of Adam’s design repertoire. In some cases, I wished there could have been floor plans or section drawings included to understand the design better. Some grand rooms were taller than one story, and I was curious about how the plans were arranged. In the gallery at Apsley House shown above, which was a later alteration to the house by Benjamin Dean Wyatt in 1819 after the house was built between 1771 and 1778, the ceiling skylights show this to be on the top floor. The house also contained a stately drawing room with an ornamented barrel-vaulted ceiling and a gracefully curving staircase. It would be interesting to see how these features were arranged in the plans. Of the several elaborately designed staircases shown from all these houses, two of the most striking are from 44 Berkeley Square shown above and from Astor House at 2 Temple Place shown below. At 44 Berkeley Square, the front facade of the house belies what’s found just inside. Designed by William Kent in 1730, the curves, ionic columns, and domed top of this layered staircase would inform a visitor of the kind of detail to be found throughout the rest of the interior. At Astor House, the craftsmanship of the woodwork in the staircase culminates in a carved frieze just below a cove-curved, glass-enclosed ceiling, and detailed carving is found throughout. The book progresses chronologically, and at the end there were a few surprising, modern designs. For example, the Richard Rogers House in Chelsea maintains its traditional exterior while the inside has been completely recreated in a sleek, airy style. It was intriguing to see how these houses were used, changed, and maintained over hundreds of years in some cases. Reading about these historic homes provided a fascinating tour of a way of living that’s all but gone and an ornate style of design that’s well-worth preserving. All photos from Great Houses of London by James Stourton, Photographs by Fritz von der Schulenburg, $65.00 Hardback, Published by Frances Lincoln. 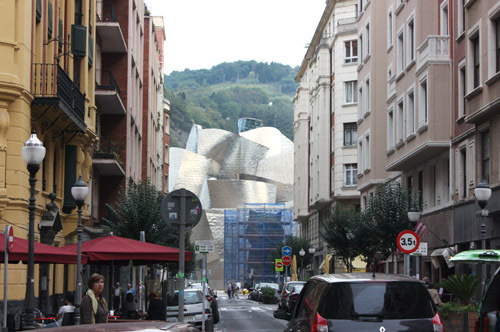 I remember being a graduate student in the Architecture program at the University of Texas at Austin when I first saw sketches of the proposed Guggenheim Bilbao Museum by Frank Gehry. 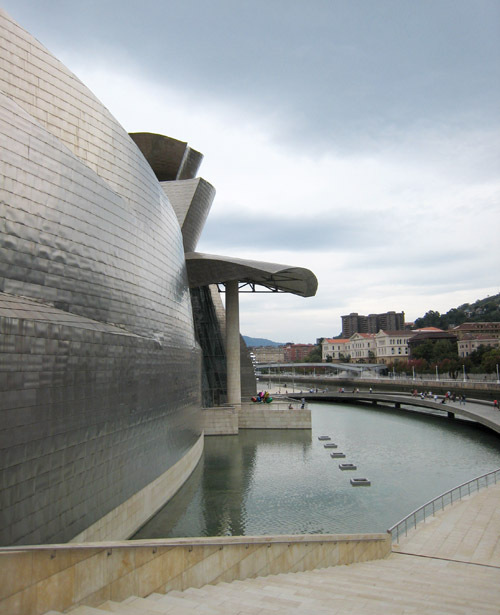 I remember learning that Gehry was using software called CATIA (Computer Aided Three-dimensional Interactive Application) which was more commonly used in the aviation industry. I remember being impressed both by the visual impact of the design of the museum and the process by which it was being designed. Construction of the building was completed and the museum opened in October of 1997. Fifteen years later, I visited the museum. In the photo above, the floral puppy sculpture by Jeff Koons was surrounded by scaffolding as it was receiving a new set of flowers. A view of the museum from across the river. The red, vertical structure of the Puente de los Príncipes de España, or La Salve Bridge over the Nervion River, was designed by Daniel Buren in celebration of the tenth anniversary of the museum. It was a thrill to walk all the way around the building and see the changing light and shadows across the fluid, titanium surfaces. The the thirty feet tall spider sculpture, Maman, by Louise Bourgeois is an impressive sight on the plaza next to the river. 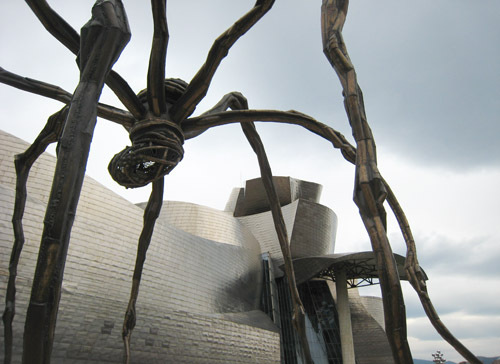 I was fortunate to see another arachnid piece by Bourgeois earlier this year at the Palm Springs Art Museum. 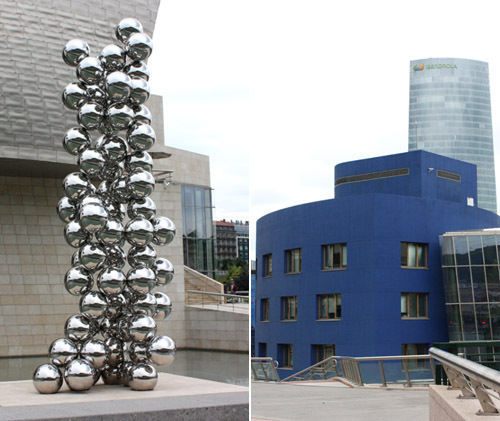 A sculpture of silver balls by Anish Kapoor sits near the spider, and on the opposite side of the museum is the bright blue building that houses the museum offices with the Iberdrola Tower by Cesar Pelli in the distance. 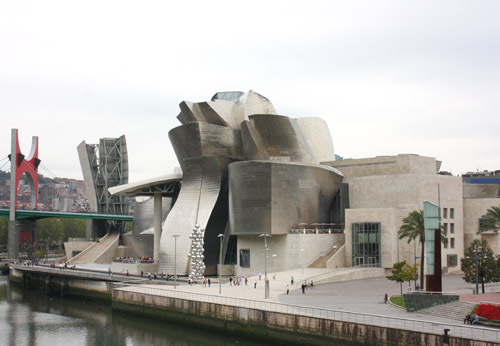 The building is said to loosely symbolize a ship as it occupies the former port on the river. 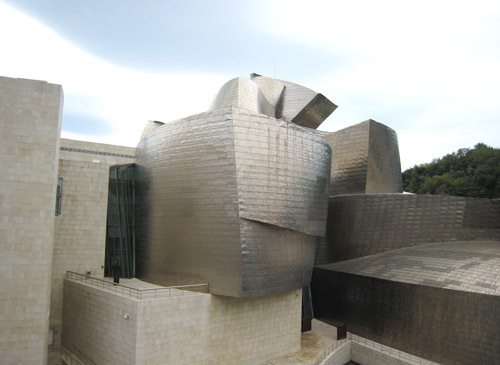 Gehry also fondly references fish and their perfectly curving shapes, and the shining titanium sheets are reminiscent of scales. 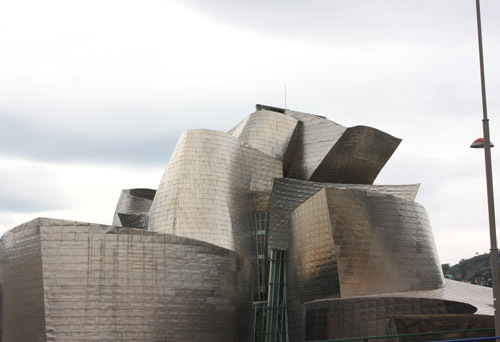 Inside, glass and limestone define the spaces, and the curving shapes continue. 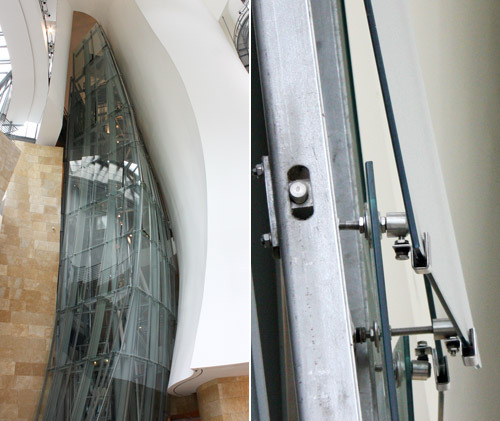 On the right above, a detail view of the metal clip connection for one piece of glass. The building is as delightful in real life as I thought it was for all those years of seeing it only in photos and sketches. Previously, I mentioned that I was determined to use our removed bamboo stalks creatively. I was intrigued by the circular cross sections and how each cut piece was unique. I started positioning them side by side in groups to form different shapes. 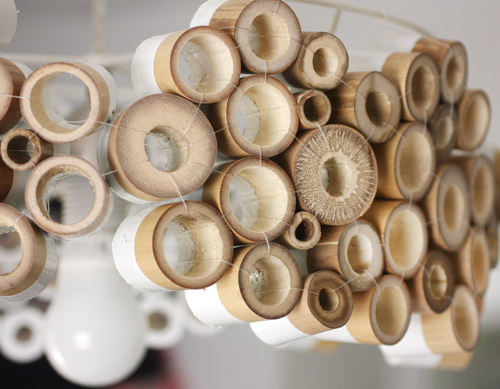 I imagined these groups of cut bamboo pieces forming a lamp shade. 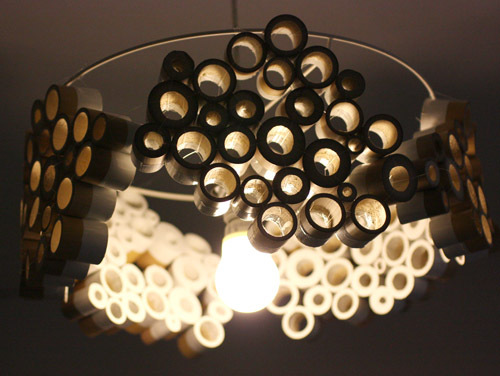 I wanted to see the play of light passing through the circular openings in all the pieces. My first tests involved tying plain, cut bamboo pieces together with twine, but the look was too 1970s macrame. Although, I loved the look of the natural color of bamboo, I wanted the finished piece to have a fresher, more modern feel. I decided to partially dip each piece in a pale, high gloss paint to lend a clean shine but keep some of the natural color. And, I switched out the twine for microfilament fishing line so the connecting material would disappear at a distance. 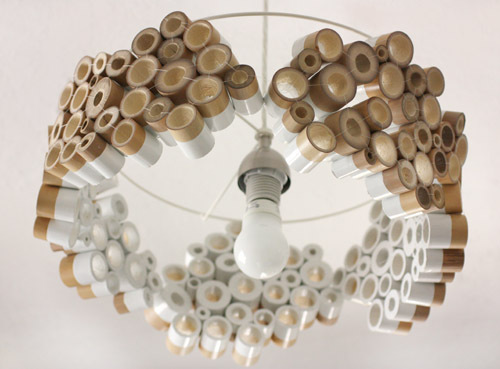 The structure is a ring removed from an existing lamp shade. 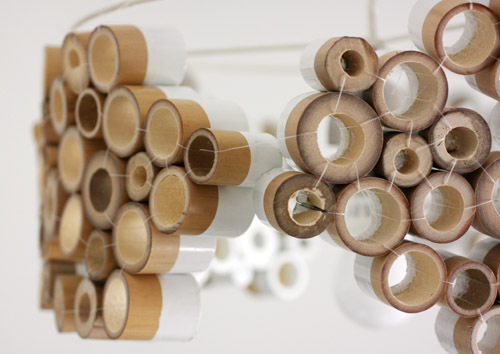 After the bamboo pieces were tied into groups, the groups were connected to each other and then attached to the metal ring again with microfilament fishing line. The light itself is a pendant lamp kit ordered from Amazon. The hanging cord was threaded through the lamp shade and then wired into the ceiling. I’m thrilled to have been able to use our homegrown bamboo and to see it now in a completely different way from how it appears in the garden.